Identifying An Equestrian – Are You Guilty? 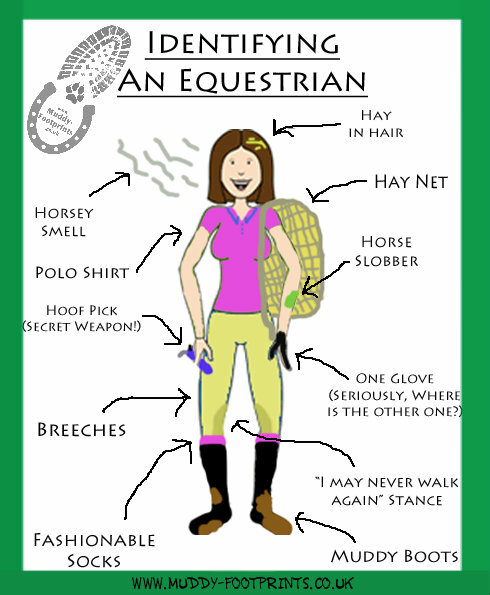 Can you Identify an Equestrian – Are you guilty of any of these? 1. Hay in hair – Yes, in their hair, on the back of their jumper/coat and in fact, all over them. 3. Horse Slobber – A strange green/brown slobber stain on their jumper? 5. One glove – Seriously, where is the other one? 6. The “I may never walk again” stance. We all know how that feels! 7. Muddy-Footprints , Following someone around the supermarket wearing their filthy yard boots. 8. Fashionable socks – Wearing jodhpurs boots with some knee high coloured socks or socks poking out the top of the boots. 10. A Hoof Pick poking out the handbag? – An Equestrians secret weapon!! Own up, are you guilty? Previous PostPrevious Sponsorship – Advice / Opinions ?